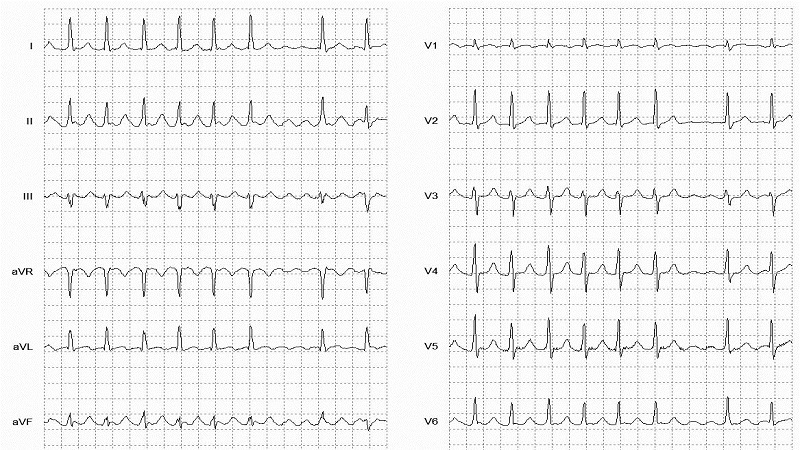 Is a narrow complex tachycardia with a regular atrial activity at - 300 bpm. Flutter waves ("saw-tooth" pattern) best seen in leads II, III, AVF . Flutter waves in V1 may resemble P waves. Loss of a clear isoelectric baseline. There can be a fixed AV block (e.g. 2:1. 3:1, 4:1, etc). or a variable AV Block (mimicking atrial fibrillation). In atrial flutter with variable block the R-R intervals will be multiples of the P-P interval - e.g. assuming an atrial rate of 300bpm (P-P interval of200 ms), the R-R interval would be 400 ms with 2:1 block, 600 ms with 3:1 block, and 800 ms with 4:1 block. 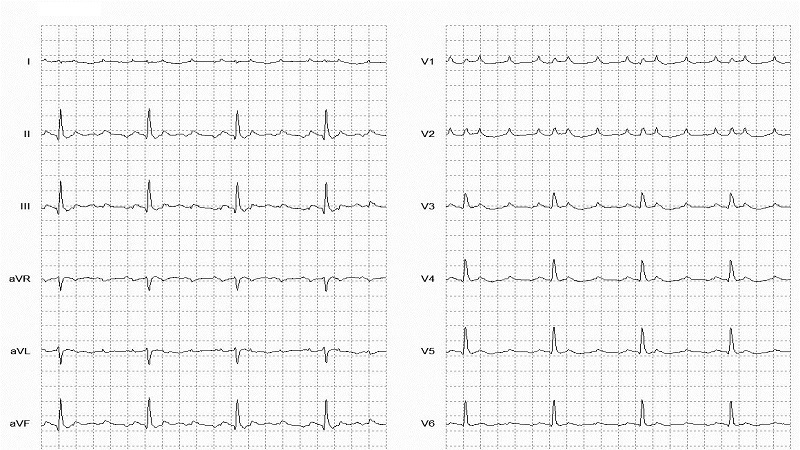 Look for identical R-R intervals occurring sporadically along the rhythm strip; then look to see whether there is a mathematical relationship between the various R-R intervals on the ECG. In contrast, atrial fibrillation will be completely irregular, with no patterns to be discerned within the R-R intervals.